The majority of businesses in the UK don’t care about direct second-level .uk domains, even when the benefits are spelled out for them, according to Nominet research. The new survey found that only 27% of businesses would “definitely” or “probably” exercise their new right to buy a .uk domain that matches their .co.uk or .org.uk name. That number only went up to 40% after respondents had seen a brief Nominet marketing pitch, the survey found. Another 16% said they had no plans to get their .uk, post-pitch, while 44% remained undecided. 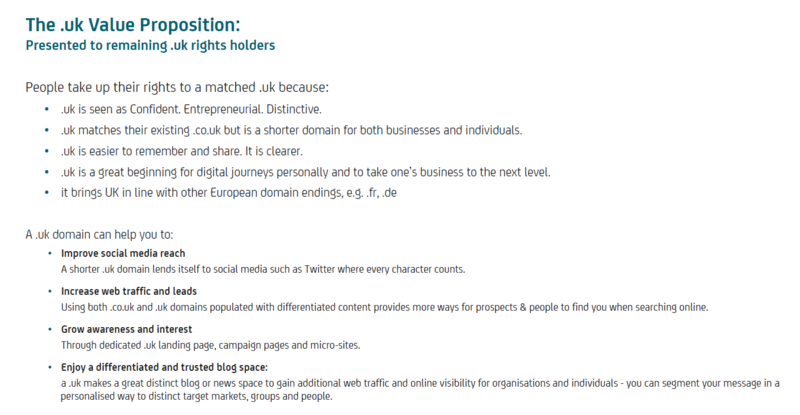 Under the direct .uk policy, all registrants of third-level domains, such as example.co.uk, have the right of refusal over the matching example.uk. If they don’t exercise that right by June 10, 2019, the matching SLDs will be unfrozen and released into the available pool. 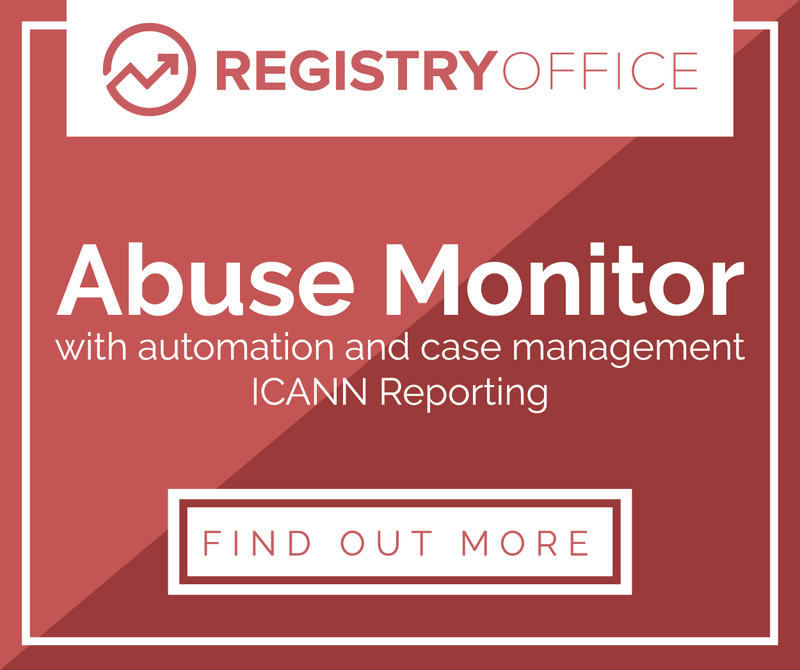 The new Nominet research also found out that most registrants don’t even know they have this right. Only 44% of respondents were aware of the right. That went up to 45% for businesses and down to 33% for respondents who only owned .uk domain names (as opposed to gTLD names). A quarter of respondents, which all already own 3LD .uk domains, didn’t even know second-level regs were possible. Of those who had already bought their .uk names, over two thirds were either parking or redirecting. Individuals were much more likely to actually use their names for emails or personal sites. The numbers are not terribly encouraging for the direct .uk initiative as it enters into its third year. They suggest that if something is not done to raise awareness in the next few years, a lot of .co.uk businesses could find their matching SLDs in the hands of cybersquatters or domainers. Nominet members (registrars and domainers primarily) were quizzed about possible ways to increase adoption during a company webinar today. Suggestions such as making the domains free (they currently cost £2.50 a year, the same as a 3LD) or bribing a big anchor tenant such as the BBC to switch were suggested. There’s a lot of dissatisfaction among the membership about the fact that .uk SLDs were allowed in the first place. The number of second-level .uk names has gone from 96,696 in June 2014 to to 350,088 last year to 593,309 last month, according to Nominet stats. Over the same periods, third-level regs have been shrinking, from 10.43 million to 10.22 million to 10.08 million, . Nominet has launched its controversial .uk service, enabling Brits and others to register directly at the second level for the first time. It did so with an endorsement from quintessential uber-Brit, gadget nut, Apple slave and national treasure Stephen Fry and a marketing splash including a .uk domain apparently visible from 35,000 feet up. 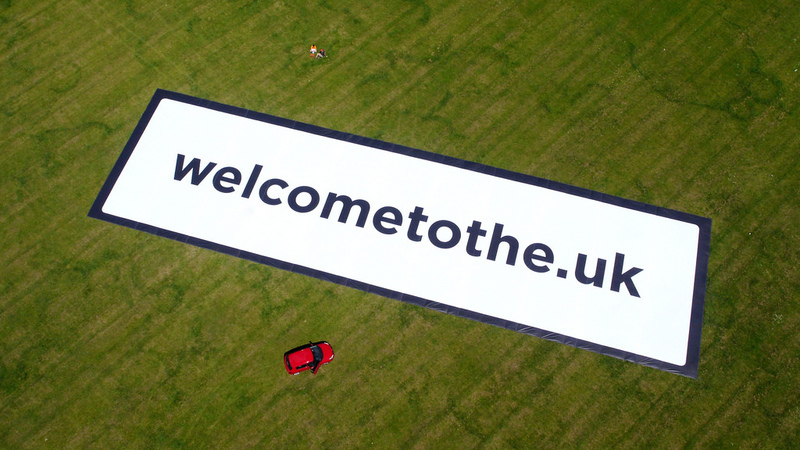 This sign has been placed in one of the main flight paths into Heathrow. Readers flying in to London for ICANN 50 later this month might want to ask for a window seat. Actor/author/comedian Fry was the first to be given a .uk today. He’s switched from stephenfry.com to stephenfry.uk as a result — the .com is already redirecting to the .uk. It’s only three harmless key-presses, you may think. A year or so back I wrote that it seemed to me annoying and lax of the British internet authority (if such a body ever existed, which it didn’t and doesn’t) when domain names were being handed that they were so inattentive and their eyes so off the ball. How come Germany could have .de, France .fr, South Africa .za, Italy .it etc etc etc? And we poor British had to have the extra exhaustion of typing .co.uk. Three whole keystrokes. It doesn’t stack up to much when compared to other howling injustices in the world. The length of time poor students and tourists have to queue to get an Abercrombie and Fitch polo shirt for example, but nonetheless it has been a nuisance these twenty years or so. His involvement has helped the news hit many of the major daily newspapers in the UK today. 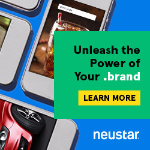 This is how to launch a TLD. Fry’s friend Prince Charles was given princeofwales.uk last December, among 69 domains previously under .gov.uk that the government requested receive special treatment. While new .uk addresses are available to register now, you won’t be able to immediately register one that matches a .co.uk unless you’re the owner of that .co.uk. All .co.uk registrants have been given five years to decide whether they want the .uk equivalent, which carries a £2.50-a-year fee ($4.20), assuming a multi-year registration. That’s the same as a .co.uk. Assuming .uk gets good uptake and that most registrants will keep their .co.uk names for the foreseeable future, Nominet’s accounts could be in for a significant boost. Owners of .org.uk or .me.uk names only get the free reservation if the matching .co.uk is not already registered. Otherwise, they have to wait five years like everyone else. The household of Prince Charles, the Prince of Wales, has become one of the first bodies to receive a second-level .uk domain name, Nominet announced this morning. Nominet has delegated the new second-level .uk domain names royal.uk, princeofwales.uk, supremecourt.uk and jcpc.uk to the Royal Household, the Household of the Prince of Wales and the Duchess of Cornwall, the Supreme Court, and the Judicial Committee of the Privy Council respectively. These were among 69 second-level names requested by the British government for special treatment in advance of the broader Direct.uk initiative, which is due to kick of mid-2014. The full list of government names will be published in February, Nominet said. Under Direct.uk, registrants of .co.uk names will get five years to decide whether they want to register the matching .uk name.